The opening of the first Taco Bell in The Netherlands is, in my opinion, the best thing that has happened in 2017 so far. The restaurant opened in the city of Eindhoven on April 4th and I, admittedly, have yet to pay a visit. I unfortunately haven’t found the time for a 1-hour train trip to Eindhoven with the mere goal of getting a taco just yet. However, I will definitely find some time to do so once summer is here. 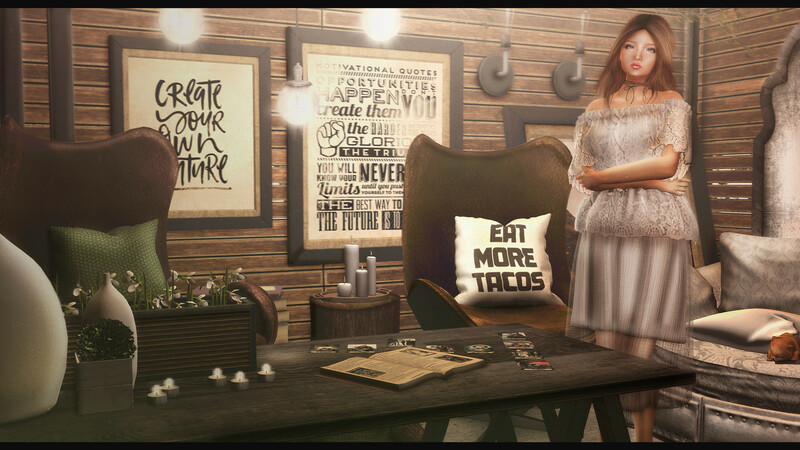 Until then, Ariskea and The Den will continue to remind me to get tacos with the “Eat More Tacos”-pillow that is part of their latest collaboration. The full set consists out of a mix of inspirational prints and food recommendations, which are certainly inspirational too. I combined the set with a few pieces of Fancy Decor‘s release at the FaMESHed anniversary round, which I highly advise you to visit if you haven’t yet. May seems to be the month of anniversaries as ULTRA also just opened its anniversary round on May 15th. I am wearing MINA‘s ULTRA exclusive and it is absolutely gorgeous. Grab a SLurl to ULTRA here and drop by before the event closes on June 15th.